There aren’t many chances for do-overs in the dog eat dog world of New York City real estate. But developer Miki Naftali has gotten exactly that — not that he really needed one. The high-profile real estate titan is launching sales at the second of two condo projects he’s building on a single block on W. 77th St.
Having already sold 70% of the units at the first project, the mogul is now ready to put the lessons he learned from selling apartments on one side of the street to use on an identically sized building on the other side, one year later. “It’s a very unusual scenario,” Naftali told the Daily News. The new project, at 221 W. 77th St., is decidedly similar to its predecessor, at 210 W. 77th St. Both buildings were designed by Danish architect Thomas Juul-Hansen, both are on a tiny block on W. 77th St. between Broadway and Amsterdam Ave., and both have a similar number of units. The new building has 26, while the previous project had 25. But there are a few key differences, inspired by feedback from buyers who eyed 210 W. 77th St. In essence, the new building is similar to the old one — but with a few key tweaks to appeal to prospective buyers who, for whatever reason, did not find what they were looking for across the street. For one, the new building has a more traditional Upper West Side look, with large traditional casement windows rather than the distinctive long mahogany windows designed by Juul-Hansen across the street. The oversized mahogany fenestration, which was completely unique for the Upper West Side, proved to be hit or miss with buyers in the first project. The design of the kitchens is also a slight departure from the sleek, ultra-modern kitchens of 210. 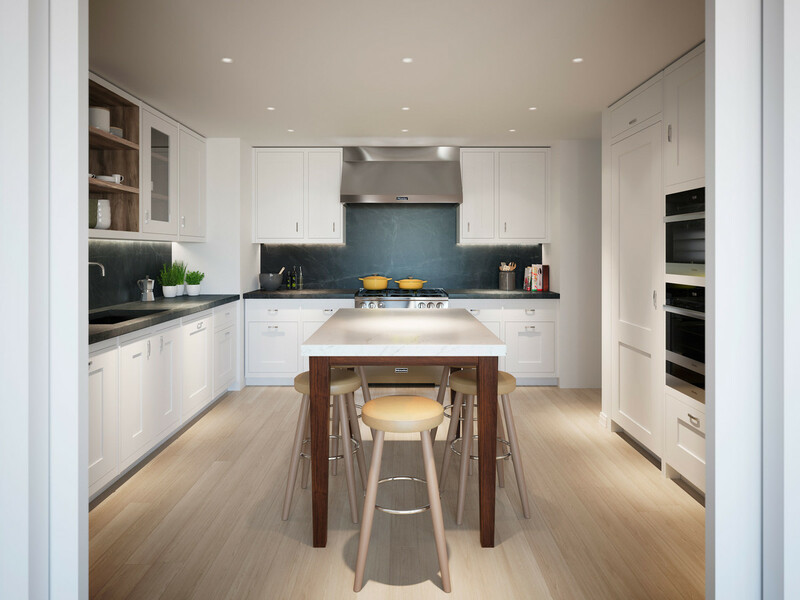 While the kitchens in the new building are certainly quality — they’re designed by Smallbone and have Miele appliances — they’re more understated and geared towards Upper West Side families looking for comfort above all else. Naftali has also shaken up the unit mix in his new project, adding a small number of two- and five-bedroom homes in order to meet demand from buyers who couldn’t find what they were looking for across the street. Units are comprised of half and full-floors as well as a townhouse and a large penthouse. By comparison, the project across the street had no two-bedroom apartments and just a handful of five-bedroom homes. A basketball court was also added to the amenity package. The new project is just a smidgen more expensive than the last, with prices ranging from $4.85 million to $23 million, the Daily News has learned. But Naftali said that bump has more to do with the state of the condo market than the quality of the building.